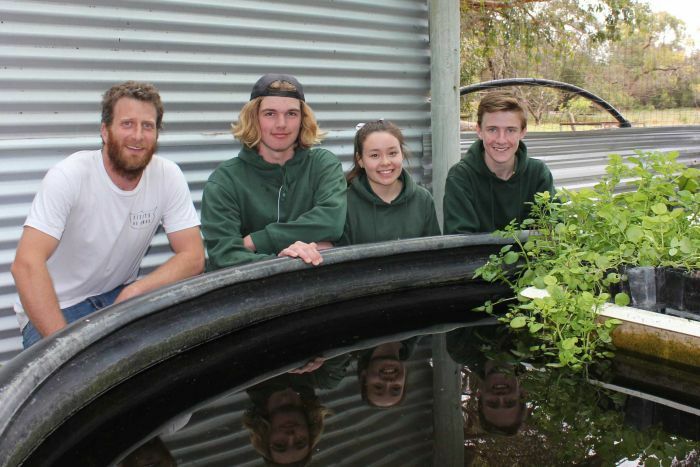 A tiny regional school tucked away in bushland in South Australia's south-east is hoping to become a model for sustainable living with a 100 per cent solar-powered trout farm. Kangaroo Inn Area School, about 40km north of Millicent, has begun a major renewable energy project that will see its students construct solar panels to be attached to a battery storage pack, and run pumps that currently recirculate water through the fish farm. Fish waste is absorbed by pots of watercress, which are irrigated while cleaning the water so it can be returned to the tank.